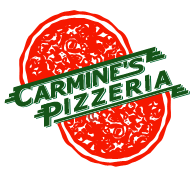 Online ordering menu for Carmine's Pizzeria. This year we are celebrating our 35th anniversary. We are original, New York style pizza place in the heart of North Dallas. We serve fresh pizza, calzones, strombolis, pasta, everyday, same as the very first day when we were open. With carryout, delivery, and dine in options, why not see why were rated #1 pizza in Dallas by D-Magazine!? Only outfit in the state that delivers alcohol!! Located on the NW corner or Coit Rd and Campbell Rd, just one block west of The University of Texas at Dallas.